In order to try and better answer some of the questions our players have been having on the Guardians, we have decided to create a FAQ to put all of this information together in one place so the players can find what they are looking for with greater ease. Q: What exactly are the Guardians? A: A Guardian is a new building that can be constructed within your cities on the newly installed Guardian Platform! Currently they behave like normal buildings and fall under the same rules and restrictions as others within your Kingdom. Q: Where did my building that was in the current Guardian location go? 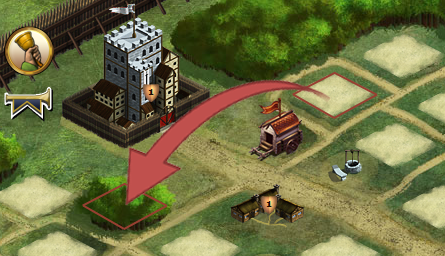 A: This square was moved down to the left side of your castle and replaced the “Bush” graphic that was in every city. Q: How many Guardians can I construct? A: You can build 1 Guardian per city. Each bonus that the Guardians apply is also city specific. Q: What benefits does building a Guardian provide? A: Currently Guardians provide various bonus’s to your city and its troops. Right now only the Wood Guardian is released, so the Bonus this Guardian provides is +% to Wood Production and Capacity as well as a +% bonus to your troop HP. Different Guardians have different bonuses once they are released, so stay tuned! Q: What does the “Wilderness” requirement mean when I go to upgrade my Guardian? A: In addition to the normal resources, you are limited on the level you can upgrade your Guardian to by the levels of the Wilds you currently own. If the highest level Wild you own is level 7, then you will be unable to progress any further until you conquer a higher level Wild. 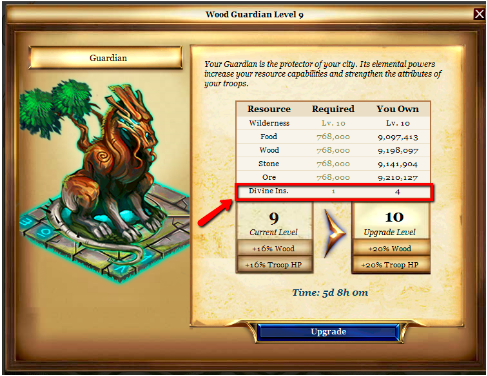 Each requirement is city specific, so you may be able to upgrade your Guardian to a higher level in certain cities compared to others. Q: Does upgrading a Guardian to level 10 require a Divine Inspiration? A: Yes it does, just like your other buildings. The confirmation screen is coming soon. Q: Do you plan on releasing new Guardians and when can we expect to see them? A: Of course! There will be many new Guardians released in the future, which can include any number of new bonuses. Q: I can’t seem to deconstruct my Guardian. Will I ever be able to? A: Yes, once more Guardians are released you will be able to “release” your existing one instantly (unlike deconstructing) and begin rebuilding a new Guardian from scratch. Q: Will we be able to change our existing Guardian when a new one comes out so I can keep my current Guardian level? A: Yes! We will be releasing an item that will allow a player to transform their current Guardian into a new type of their choice. Q: Will Guardians gain any additional features in the future? A: Yes, all Guardians will become stronger as the patches go on! We can’t reveal what buffs and changes they will undergo at this time, so make sure to stay tuned for future announcements!